Choose from a wide variety of styles, combinations and sizes of windows when you select the Soft-Lite® Windows line of Bainbridge LE windows. Save on energy bills and keep out drafts. 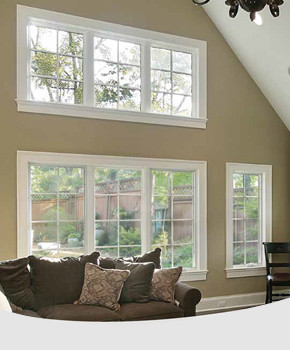 Bainbridge LE windows are available in the following styles: double-hung, slider, casement, bay, bow, eyebrow or awning. Fusion welded frame and sash provide long-lasting strength and durability. Dual-fin, wool-pile weather stripping wraps the sash perimeter and minimizes air infiltration. Cam-action lock pulls sashes tightly together for exceptional security. Certa-Force™ balance system ensures smooth, easy and maintenance-free operation on double hungs. Intercept® stainless steel spacer system (standard) significantly reduces condensation. Optional metal-free Super Spacer® offers enhanced thermal efficiency and other unique benefits. Minimize any air infiltration into your home with a Bainbridge LE window from Soft-Lite®. Bainbridge LE windows are over two times more airtight than the industry average of vinyl double hung windows, and three times more than the average wood double hung window. Learn more about the Bainbridge LE line on Soft-Lite's® website. Define your style today. Make your home your own today.